Braised lamb shanks used to be one of those dishes I ordered exclusively in restaurants. Between the fall-off-the-bone meat and the rich sauce scented with herbs and layered with flavor, this luxe-seeming meal felt intimidating to make at home. As it turns out, this meal is much more doable than it lets on (it鈥檚 actually pretty foolproof!) 鈥� here鈥檚 how to do it. 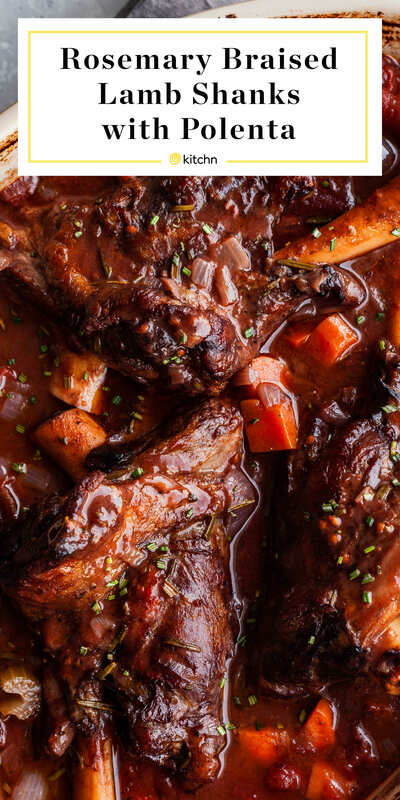 Like any braised meat, lamb shanks are easier to pull off than you might think. To make it more approachable, I think it鈥檚 helpful to break down this braise into four steps: searing, saut茅eing, adding the liquid, and cooking in the oven. The first few steps are hands-on, but once the lamb goes in the oven it doesn鈥檛 require much attention. Sear the meat: You鈥檒l start by searing the shanks in a Dutch oven or braiser. If the pieces of meat are large, it鈥檚 helpful to work in batches so you don鈥檛 crowd the pan. Saut茅 the vegetables: Next, the lamb shanks are held on a plate and the vegetables are saut茅ed until soft. Add the liquid: The pan is deglazed with red wine and reduced by half, before the remaining liquid (canned tomatoes and beef broth) are added to the pan. 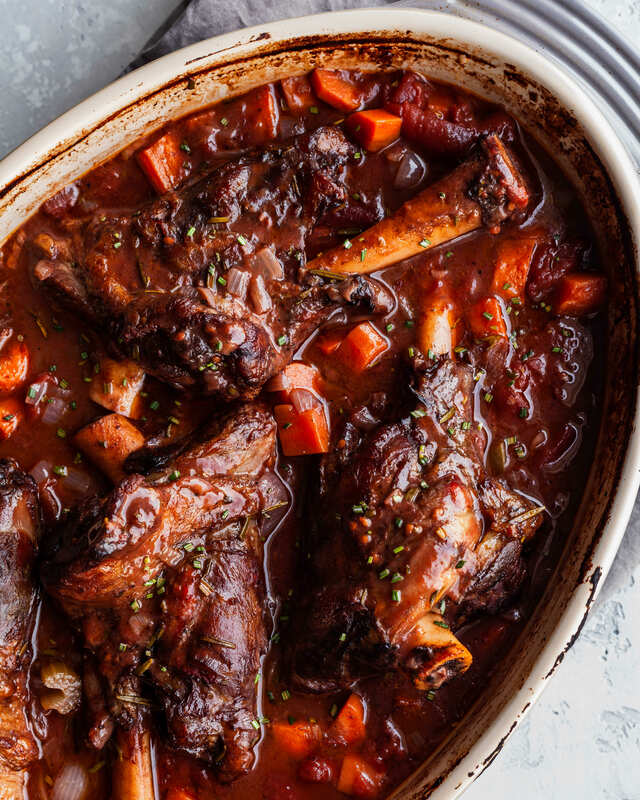 Cook in the oven: Once the liquid comes to a boil, the lamb shanks are added back to the pan. The pan is covered and left to cook in the oven for two to two-and-a-half hours. Arrange a rack in the middle of the oven and heat to 350掳F. Pat the lamb shanks dry with paper towels, then season all over with the pepper and 2 teaspoons of the salt. Heat the oil in a braiser, 6-quart or larger Dutch oven, or wide heavy-bottomed pot over medium-high until shimmering. Working in batches if needed, sear the lamb shanks until browned on the bottom, 4 to 5 minutes. Flip and sear the other side for 4 to 5 minutes more. Transfer the lamb shanks to a large plate. Reduce the heat to medium. Add the onion, carrot, celery, and garlic and cook, stirring occasionally, until softened, about 5 minutes. Sprinkle with the flour, stir to coat the vegetables, and cook 1 minute. Add the wine and scrape the bottom of the pan with a wooden spoon to loosen any browned bits. Simmer until the wine is reduced by half and thickened slightly, about 10 minutes. Stir in the tomatoes and their juices, broth, rosemary, thyme, and remaining 1 teaspoon salt. Bring to a boil, breaking the tomatoes up with the wooden spoon. Return the lamb shanks to the pan and arrange in a single layer, pushing them into the sauce so they鈥檙e about halfway covered with liquid. Cover and place in the oven. Cook, flipping the lamb halfway through, until the meat is very tender and pulling away from the bone, 2 to 2 1/2 hours total. Stir in the vinegar, cover again, and set aside to rest on a wire rack for 10 minutes before serving. About 30 minutes before the lamb is ready, make the polenta. Bring the water to a boil in a medium saucepan over medium-high heat. Slowly whisk in the salt and cornmeal. Reduce the heat to low and cook, whisking constantly, until the polenta is smooth and slightly thickened, about 2 minutes. Cover and cook, stirring every 10 minutes and scraping up the sides, bottom, and corners of the pan, until creamy and tender, about 30 minutes total. Remove from the heat, stir in the Parmesan, and cover to keep warm. To serve, divide the polenta between bowls. 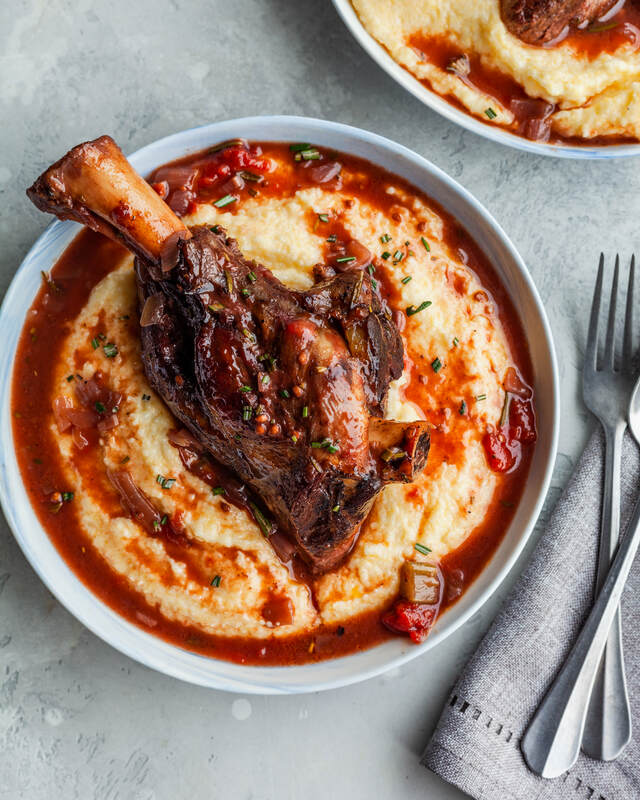 Top with a lamb shank, then spoon the sauce over the lamb and polenta. Storage: Leftovers can be stored in a covered container in the refrigerator for up to 4 days.